A Wargaming blog covering Tabletop Wargaming - The universes, books, fluff and gaming. From writers up and down the East Coast: MikeD, AmateurDorn, TaoChi, Lord Castillo and Wynforth. Step 1 put your thoughts down on paper. This will be your map or guide so to speak. 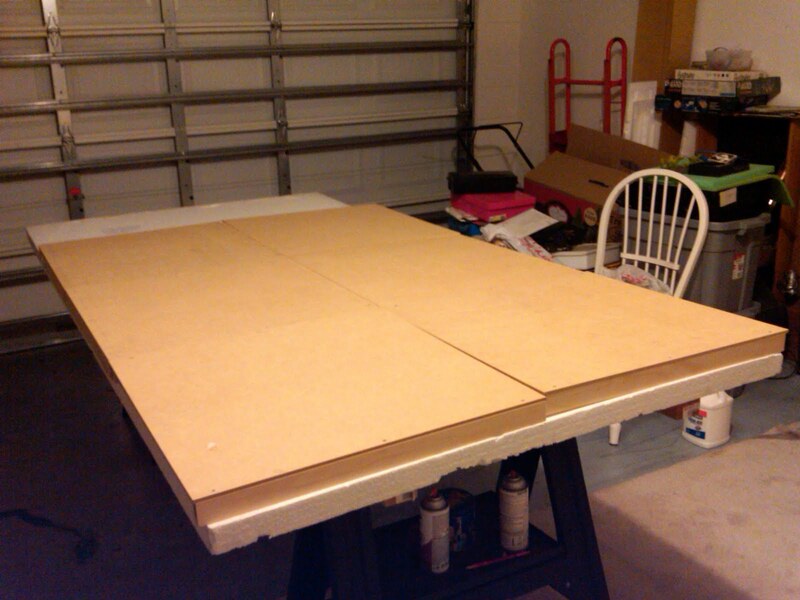 From the photo you can see we are working with a 6'x4' board and it is broken up into 6 2'x2' tiles. 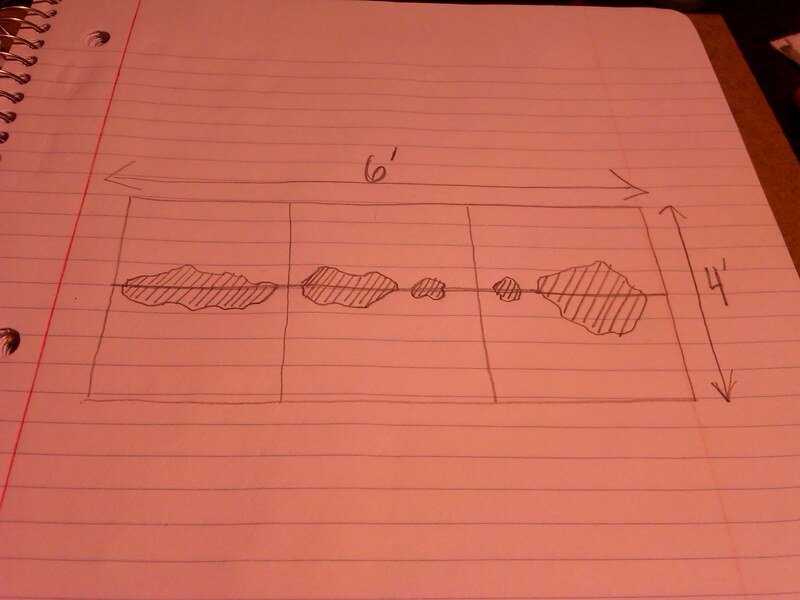 I have drawn in some terrain pieces to indicate more or less the direction I want to go. Step 2 Assemble your board. 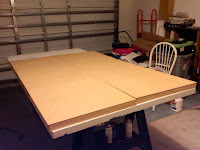 I purchased 3 4'x2' MDF boards from the local hardware store and had them cut the 3 boards in half to give me 6 2'x2' sections. In addition I picked up 4 slats of 1"x6' and had them cut into 2' sections for a total of twelve 1"x2' pieces. Using some wood screws I screwed in two slats per tile on opposing sides. The reason for the slats is to give the table a little height but more importantly to give you access underneath the board so that you can move it around without touching the top. Step 3 Making the terrain pieces.You will need some foam, I like to use the pink insulation foam which can be purchased in large 8'x4' sheets. In addition you will need a foam cutter and a hot glue gun. With the foam cutter you will want to cut out some sizable chunks of foam out and if you are adding layers trace the piece that you just cut so you will know the general size and shape that you will need to cut next. To create the terrain edge take the foam cutter and angle it about 45 degrees and move it back and forth in a sawing motion going around the whole piece. This will give you a nice rock face edge. I then dry fit the pieces on the board across two tile edges and adjust them to a place that is pleasing to the eye. I then determined a center line between the tiles, marked it off with a straight edge ruler and proceed to cut the pieces in half. Once that is complete this is where the hot glue gun comes into play. Please be careful when using this device they don't call it a HOT glue gun for nothing. Glue the pieces and place on the board keep in mind that the piece will adhere quickly so make sure your placement is good because there will be little room for error. Drunk with power? Angel Sanguine Icons and Greenstuff Plans. Blog Changes: For Good and For Awesome!! Thing a day, 2/15-2/16: Game Day and Cleaning! Thing a Day 2/14/11 Toy Time! Thing a Day: 2/7 - 2/11 Back in action! Thing a Day 2/3-2/5 Reinforcements and more! Thing a Day, 2/2/11 S.S.D.D. This web site is completely unofficial and in no way endorsed by Games Workshop Limited. All associated marks, names, races, race insignia, characters, vehicles, locations, units, illustrations and images from the Warhammer Fantasy or Warhammer 40,000 universe are either ®, TM and/or © Copyright Games Workshop Ltd 2000-2011, variably registered in the UK and other countries around the world. Used without permission. No challenge to their status intended. All Images and All Rights Reserved to their respective owners.